We ended the first semester of Capital High School’s Big History class with Investigation 6. On the final day of the semester, students completed their Investigations and submitted them to BHP Score. I also scored the essay myself. Having sent in Investigation 2, the students knew the type of detailed feedback they would be getting from BHP Score. We were excitedly anticipating their scores. I wanted the students to experience growth and improvement. When the scores for Investigation 6 arrived a few days later, I revealed each student’s overall score and the class average. The scores had improved from Investigation 2, and the overall average went up. We had progress and improvement. It was small, maybe, but we were going in the right direction. BHP Score breaks the writing process down for students. Reflecting on the process and being very specific about what they need to focus on helps all students to improve and grow over the course of the year, which is the goal. I had kids who improved greatly and also those who improved just a little bit. I also had a student who did not improve in any areas, but instead slid backwards. Each of these results brings a great learning opportunity for students. They don’t need to be perfect or even to get an A, but they do need to show growth and learning. 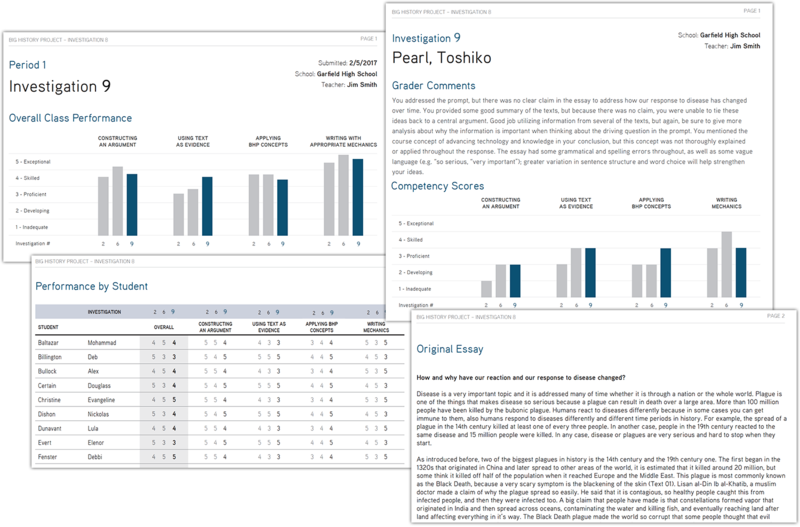 Note: this is the second of a series of blog posts I’m writing about my classroom’s experience with BHP Score this year. Read the first one, BHP Score: A Tool for Self-Improvement. About the author: Steve teachers two sections of Big History as a full-year tenth-grade world history course at Capital High School, an International Baccalaureate school in Olympia, Washington. Steve has been teaching BHP since 2015, and is particularly appreciative of BHP’s emphasis on skills like argumentative writing and claim testing, which he thinks is especially relevant today.